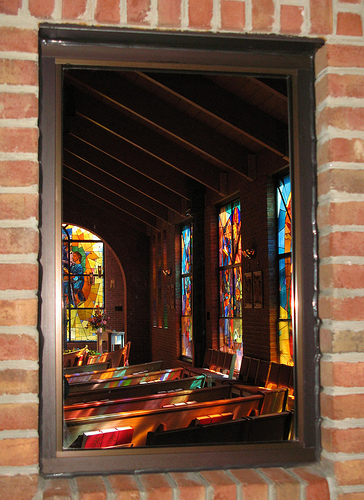 In this interesting photograph, a mirror is hanging inside the church and shows a reflection of stained glass windows and pews. It appears to look like a window, but it's actually a mirror. I also photographed a series of colorful images thoughout the church. The Corpus Christi Catholic Church is located on 234 Southern Boulevard in Chatham, NJ. The town is located in Morris County.